Now hold down button "mute". Those button definitions do not look very useful. sampling mode, which requires someone keeping the conversation going. but my main issue seems to relate to this particular remote rigth now. currently I only got this one USB device to work with. it looks like this old remote should still work. > transmitting of button events. *think* you just could replace the irtoy.c file. > irtoy driver with idroid support. > 0x0 as button codes. mask? Occasionally, using another button has worked for me. > mask? Occasionally, using another button has worked for me. certainly did not use before. Nothing happens there. the random button phase is normal. > device), see attached patch. boot-loader to update it easily. See e.g. avoids usage of the GPIO pins on old FW versions. that one, but yes, it is awfully expensive for such a simple device. was much simpler with the old serial port. the one German shop that has it listed doesn't actually seem to sell. trouble with this particular remote. > boot-loader to update it easily. See e.g. Hm … but there is at least a way to get current firmware on it. > IrScrutinizer to capure the signals. build working to check it out. It's this one, right? > that one, but yes, it is awfully expensive for such a simple device. > But I fail to even find simple USB receivers for sensible prices. > was much simpler with the old serial port. > i a bit strange. > the one German shop that has it listed doesn't actually seem to sell. > trouble with this particular remote. >> boot-loader to update it easily. See e.g. > Hm … but there is at least a way to get current firmware on it. You can solder ICSP pins to the PCB and use a programmer like PicKit3. >> IrScrutinizer to capure the signals. > Isn't irrecord maintained anymore? > build working to check it out. It's this one, right? > Blaupunkt car stereo remote. below. (Note the uncommon frequency.) Maybe it works. having to cobble together something from scratch. > below. (Note the uncommon frequency.) Maybe it works. > having to cobble together something from scratch. >> below. (Note the uncommon frequency.) Maybe it works. was of course no 16:9 then. > the normal 38 kHz, as detected by irrecord. LIRC_SET_MEASURE_CARRIER_MODE, which the driver does not support. implemented and tested...) 38kHz is simply the default frequency. > Don't jump to that conclusion! > LIRC_SET_MEASURE_CARRIER_MODE, which the driver does not support. It does detect the button presses, but naturally always reports "mute". >> Don't jump to that conclusion! >> LIRC_SET_MEASURE_CARRIER_MODE, which the driver does not support. accordingly. The Girs driver does this properly, the IrToy driver not :-\. > It does detect the button presses, but naturally always reports "mute". > I do not understand that sentence. 1. I added your config to my set of config files in lircd.conf.d/. 2. I started lircd and irw. of the mute button as defined in the nonsensical config I quoted. Is suspect that a simple error in irrecord fails to parse that. being unsure what exactly the differences are between the variants). >> I do not understand that sentence. > 1. I added your config to my set of config files in lircd.conf.d/. > 2. I started lircd and irw. > of the mute button as defined in the nonsensical config I quoted. I mean _sending_ "my" signals to your TV. match against the correct expected signal, or whatever. > Is suspect that a simple error in irrecord fails to parse that. > being unsure what exactly the differences are between the variants). Nice to hear that. Unfortunately Conrad & Reichelt do not stock e.g. > I mean _sending_ "my" signals to your TV. things like HDMI switch, beamer, LED strip. thing. There is enough space to fit in half a dozen of microcontrollers. and does not need firewall rules on my router. > (256*high + low) and denote delays in some unit. > If absolutely necessary I can hand-parse for you. consistently quick, waiting for 0xffff after each press. to the power button. Let's try others. active USB hub. Maybe a passive one can work. > Nice to hear that. Unfortunately Conrad & Reichelt do not stock e.g. the TSMP58000 and the TSOP34438 are at least listed as being in stock. compatible without modifications? The TSOP4838 is what you easily get. >> I mean _sending_ "my" signals to your TV. > things like HDMI switch, beamer, LED strip. sends for example NEC1 signals. >> If absolutely necessary I can hand-parse for you. be analyzed with the Scrutinizer (past to the "Scrutinize signal" pane). > This is the part why my limited experience comes into play. > signals from one remote usually of the same lenght? >> Nice to hear that. Unfortunately Conrad & Reichelt do not stock e.g. > delivering to mere mortals with somewhat reasonable shipping cost. > the TSMP58000 and the TSOP34438 are at least listed as being in stock. > compatible without modifications? The TSOP4838 is what you easily get. > > things like HDMI switch, beamer, LED strip. > sends for example NEC1 signals. 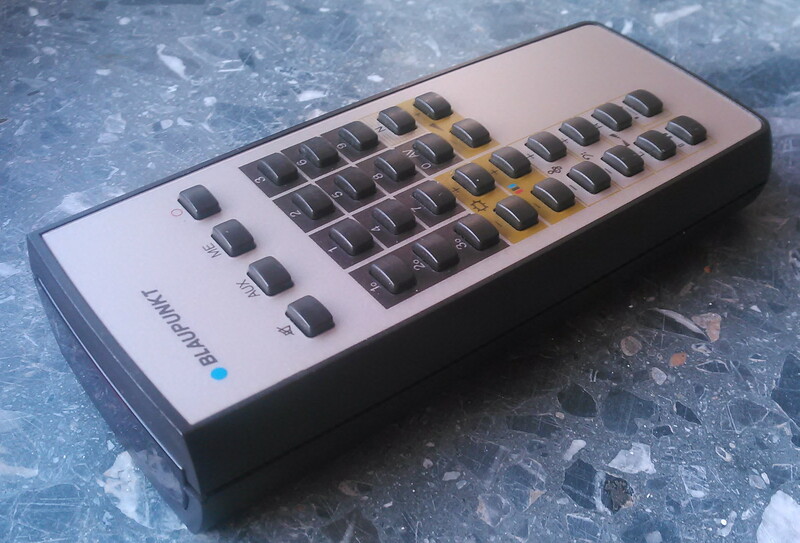 to control a PC with a cheap universal remote … it just worked back then. > and transforms it to microseconds, (256*high + low)*tick. > Should be 10 lines of Python. or such. > be analyzed with the Scrutinizer (past to the "Scrutinize signal" pane). minimum knowledge to fathom what is going on. > measurements are essentially noise. … heavily aliased by the differing frequency, you mean? irdroid with an 30 kHz receiver (and different oscillator)? >> and transforms it to microseconds, (256*high + low)*tick. Parsing of user inputs is fairly forgiving; the signs are not required. > kHz or just that my receiver sampled it at 38 kHz? settable (Options -> Fallback frequency). > minimum knowledge to fathom what is going on. >> measurements are essentially noise. > … heavily aliased by the differing frequency, you mean? yourself :-). Add the IR sending current, if appropriate. timers is limited. Considered a simple hardware AND-ing? commands according to the keys, instead of text commands. > yourself :-). Add the IR sending current, if appropriate. perhaps adding a capacitor to deliver the load. > timers is limited. Considered a simple hardware AND-ing? and then tells lirc to send the respective output signal). > > Btw. I was serious about the option to mod the remote. > This could be a very cool project. sensor, like the Wii remote … damn, don't give me ideas! > This should ("should") work. noise". Could it be that the TSOP48xx are simply the successor models? Would make sense that they are much easier to get. > > (and different oscillator)? not for the IR signal. than the maximum GPIO current of 40mA. But you can design it yourself. > perhaps adding a capacitor to deliver the load. >> timers is limited. Considered a simple hardware AND-ing? > Sorry, I am not sure what you mean with hardware AND here. Have a look at the Arduino universe. >> This should ("should") work. can mean that short signals are considered "noise". > Could it be that the TSOP48xx are simply the successor models? > Would make sense that they are much easier to get.